Hauke Gahrmann (pronounced HOW-kuh) has built his success on strong relationships, service and results. As an agent with Bond New York, Hauke employs a rigorous, enthusiastic and honest approach to real estate and to understanding the needs of his clients. He maintains a deep knowledge of real estate in Manhattan, fostered through broad experience, drive and passion for the industry. Hauke began his career in the service industry working for well-known agencies. He gained insightful experience, learning to manage a variety of personalities while providing five-star service and a dedicated attention to detail. Having worked for the Clintons’ and Martha Stewart among others, he has honed the ability to work with a wide spectrum of people, and discern particular preferences which has served him and his clients well. Working with buyers, sellers, landlords or renters, he is determined to provide invaluable full-coverage, full-service to his clients, always willing to go the extra mile. He believes your home should not only provide protection, but be comfortable and serve as your own oasis and kingdom. Hauke’s expertise, hard work and sharp negotiating continue to drive and ensure that your real estate needs are effectively and expeditiously met. He is committed to putting his clientele's best interests first. A conscientious perfectionist, Hauke boasts the motivation, follow through and organization required to streamline every detail of your intricate real estate transaction. Fluent in English and German, Hauke enjoys working with people, getting to know their unique needs and then figuring out the best course of action to make their real estate journey a smooth and fruitful one. Outside of work, which consumes most of his time, this Brooklyn resident enjoys traveling, basketball, music and discovering new wonders in and around Manhattan. Hauke Gahrmann found us the perfect apartment in the neighborhood we wanted on the first shot! It was a pleasure to do business with him. Everything went off without a hitch. In 2013, my husband and I were interested in buying an apartment in NYC. We started working with Kianna and Hauke shortly after beginning our search. Throughout the process, my husband and I had to adjust our expectations on neighborhood and types of apartments we could seek out. Kianna and Hauke were amazing during this process. They were flexible, adaptable and had great insight into what we would and wouldn''t like. They were dedicated, supportive and really listened to what our needs were. During contract negotiations they were tenacious and really had our best interest at hand. They were always accessible and while Kianna and Hauke have their individual strengths, together they are an absolute powerhouse. After spending so much time with the both of them, I can honestly say that they ended up being more than our brokers, but our friends as well. 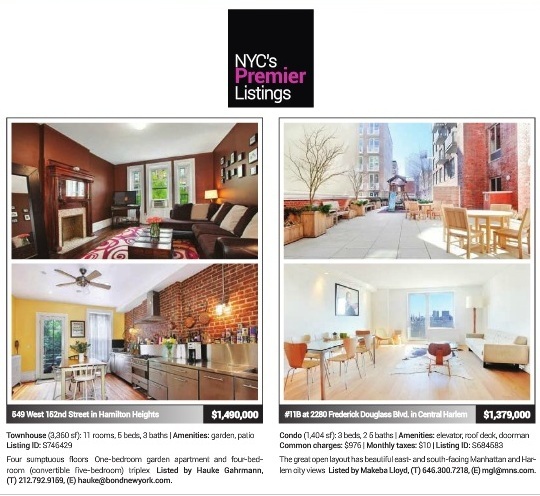 I''d highly recommend working with Kianna and Hauke for anyone trying to buy in New York. Many thanks to Hauke! He helped me find the perfect NYC apartment! He was super diligent, responsive and helpful. He was also super professional and friendly. No matter what time of day he responded to my calls and emails in a timely manner. Further, he was always on time to our meetings and there wasn''t a question he couldn''t answer (he knows A LOT about the New York real estate market). In addition to helping me find the perfect place, he also helped me find great real estate lawyer. I have heard horror stories from friends about shady and pushy real estate brokers... Hauke is quite the opposite. I would without a doubt recommend Hauke to family, friends and (even) strangers. Thank you to Hauke for finding me a fantastic place. Hauke was not only patient and professional, but armed me with valuable information regarding the neighborhood options and buying market in New York. He understood my European style and taste of prewar charming housing on one side or modern minimalist lofty apartments on the other end of my spectrum. In my four month search in 2013, I worked closely with Hauke, who carefully listened to all my interests in an apartment and calmly walked me through what could have been a very stressful experience. He found me reasonably priced studio and 1 bedrooms in a variety of neighborhoods in Manhattan from Harlem to the lower East Side and from the West Village to the far east in Brooklyn. This was perfect for finding the right neighborhood with the right apartment for me. He managed the whole process from negotiating and buying my apartment guiding me step by step until final signature. I can only highly recommend Hauke. My wife and I were looking for an apartment. Had a very good experience - quick, easy, and minimized stress. J.C.
Having previously worked with numerous brokers during the course of many NYC apartment searches, we can say that Hauke was easily the best broker we have had the pleasure to work with. His professionalism and dedication really stood out when compared to our previous experiences. What we admired the most was his genuine desire and commitment to finding us the perfect apartment. He made no attempt to "sell" an apartment that fell outside of our criteria (neighborhood, amenities, budget) or an apartment we were not completely satisfied with. He was also extremely flexible, which was important since our schedules only allowed us to view apartments during certain hours on the weekends. In short, we can''t say enough about our experience working with Hauke and we would enthusiastically recommend him to anyone looking to buy, sell or rent an apartment. I just wanted to say how happy I was with Hauke's performance as a real estate agent. He was an absolute pleasure to work with. He is very personable and professional. My boyfriend and I found the perfect place very quickly with Hauke's assistance. His knowledge of the city and its boroughs is impressive. Hauke is an honest straight shooter, who is very accommodating to his clients. I would definitely recommend working with Hauke for all of your real estate needs. December 2011 by Thurayyah M.
Hauke was a pleasure to work with, not only because of his optimism but his professionalism. I was in need of getting out of my lease. After several showings over about a month and half I had pretty much lost hope. Hauke remained diligent and found someone to actually take over my lease as opposed to subletting which was a big relief to me. I had a couple days to submit paper work, pack and move. Hauke was patient and full of reassurances during such a stressful period and even went the extra steps to make sure everything went well and to check on my relocation efforts afterward. Thanks Hauke. Hauke Gahrmann is one of the best and most diligent real estate agents I have worked with. Unlike a lot of agents who show everyone the same set of apartments / offerings in their book, Hauke took the time to really understand what kind of place I was looking for; because he took the time to listen, he was able to narrow down and focus in on places that I would be interested in. His knowledge of the NYC market enabled him to rule out places that he knew were not good, so we didn't waste a lot of time looking at poor quality apartments. Even after our first outing he kept looking and sent me updates of new opportunities. Hauke was professional, honest, able to accommodate my crazy schedule and was always on time. If you're serious about finding a quality place, I recommend you work with this guy! Being a broker myself, I can say that Hauke is one in a million! He is one of the most professional, responsive and detail-oriented real estate brokers out there. We recently did a deal together and Hauke''s assistance and cooperation was integral to getting it done smoothly and quickly. Having witnessed his client advocacy firsthand, I can attest that he puts his clients first and above all else. He was an absolute pleasure to work with and I would highly recommend him. Hauke Gahrmann was a pleasure to work with. He found me exactly what I was looking for, which in New York is pretty much unheard of. He was clear from the beginning that he was really working on my behalf, and that trust is very important to have when you''re trying to find an apartment. The process, as I know from experience, can be very daunting, but Hauke helped to make it easy, streamline and fun. I would definitely recommend working with him. I had the wonderful opportunity to hire Hauke on my search for an apartment after being through numerous brokers and agents that kept showing awful places. Not only did Hauke take the time to listen for what I was looking for but also devoted quite a bit of time to see and edit the places he chose to show me. Definitely above and beyond any service I experienced in the past. I would definitely hire Hauke again and recommend his services.